3M Filtrete Micro Allergen Reduction filter 24"x 30"x 1"
Nominal Size: 24" x 30" x 1"
Actual Size: 23.7" x 29.7" x 0.8"
Purchased these for my house in the Gulf Coast works great!!!! 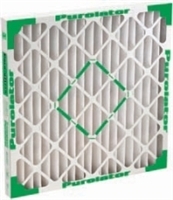 We have used this filter for several years and it sure collects the fine particles, turning somewhat gray after 3 months. Could be the force of our variable blower system which is set to continuously circulate at least some air, but it doesn't take long for these filters to bow in but not enough to cause a leak. We're going to try the next grade up with the pleated filter and see if it isn't stiff enough to resist bowing, but we've been very satisfied with the quality of the filtration on these. We'll see if going from 1000 spun fiber to 1250 pleated is worth the extra cost and we'll submit another review of those in a couple months, but these 3M filters have markedly cut down the amount of dusting that is required and deserve all 5 stars in our opinion.